The observant among you may have noticed that I’ve changed the title of my blog a little, as the weather got colder I started to question my ability to cook and eat solely outdoors, but with this wonderful October weather we’ve been experiencing, it certainly has been time to make sure all the last wishes for summer have been carried out, so we’ve had lovely days at the beach and fish and chips and a couple of outdoor meals. This is a nod to Hugh Fearnley-Whittingstalls Fish Fight, and supporting our local wonderful fishmonger. 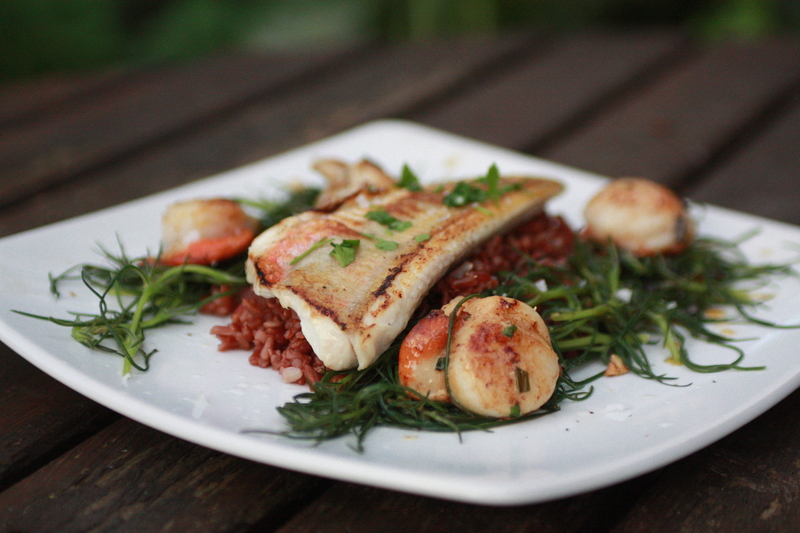 Red Gurnard is a bycatch from the trawler industry and often overlooked, and the scallops were diver caught. Pan fry fillets of Red Gurnard, a lovely firm, and I think slightly nutty tasting fish in a little olive or rapeseed oil skin side down until crisp, and then flip over, meanwhile warm a knob of butter and a little oil until it starts to go a nutty brown colour, toss in some finely chopped garlic and parsley and then the scallops, cook quickly over a high heat a minute or two each side and season. Put the dish together with some lovely nutty red rice, some steamed greens (I used Salsola from the garden) a squeeze of lemon and salt and pepper, and place the fillet on the rice with the scallops as little sweet morsels on top of the greens. Enjoy outside with a glass of cold Sauvignon Blanc (if the weather allows). I love a bit of Hugh – good man. This dish does look extremely good. Thank you, it was rather delicious.